Hard-working Chris Capraro has 37 points in 53 games for the Checkers this season. American Hockey League teams in need of a goal scorer might look at Chris Capraro's bio, find out that he's a mere 5-foot-7 and turn the page. But as Charlotte Checkers coach Derek Wilkinson quickly pointed out, Capraro sure doesn't play like he's 5-7. Because of that, the 24-year-old is one of the ECHL's most pleasant surprises this season. In 53 games, Capraro ranks second on the Checkers in scoring with 37 points — 18 goals and 19 assists. His grit and determination play a major role in his success, as Capraro has racked up 52 penalty minutes and doesn't shy away from chasing loose pucks in the corners. "He works so hard," Wilkinson said. "You see the size disadvantage and it just doesn't seem to faze him one bit. There are some games where he's looking for a dance partner. He's sincere about it. He wants to do what he can do. He seems like the type of kid that he knows his size is what it is, but he'll try to play like a 6-2 guy, which makes him kind of unique. He's been a real pleasant surprise." Capraro entered his rookie season after four years at UMass-Amherst, where he scored 28 goals and added 67 assists in 127 games. He joined the Trenton Titans, scoring a goal and an assist in two regular-season games before collecting one point in five postseason contests. Once the Titans were eliminated from the playoffs, the parent New Jersey Devils came to the conclusion that Capraro wasn't in their plans. 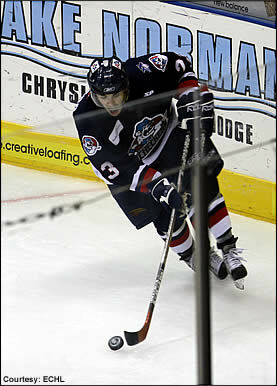 Capraro was shipped to Charlotte last August for future considerations. "We had heard about him, and Trenton had his rights," said Wilkinson, who is in his fourth full season as coach of the Checkers, the New York Rangers' ECHL affiliate. "They weren't planning on bringing him back. He wasn't looked at as a prospect in New Jersey, so we were able to get him. You always take chances on kids, and we had hopes that he could be a point producer. You don't know until you see him. He's come in and really surprised a lot of people." The biggest challenge for Capraro has been dealing with the grind of the much longer professional season. Entering the 2007-08 campaign, Capraro hadn't played more than 35 games in any season during his time at UMass-Amherst. So far, though, he has been able to overcome what usually is a large hurdle for players in similar situations. "It's been tough sometimes, both mentally and physically," Capraro said. "It's something I haven't been used to, but it's something you have to adjust to. I think I'm doing a decent job at it." "He's had some moments, but they haven't been extended," Wilkinson said. "Some guys, usually in January, it's usually a good 3-4 weeks where you think they're going backwards and then they pick it up again in February. Chris is real good at identifying the fact that he didn't play well. I don't have to really get on him very often about the things he needs to do. I think because of that, he's been able to sustain a pretty good pace all year." Wilkinson didn't expect Capraro to grow into one of his go-to guys this season, but the Checkers coach admitted the scrappy forward has become just that. "On the power play, we have no problem using him at any time," Wilkinson said. "He's got great hands and he competes and he sets guys up. Being a rookie, I think sometimes he tries too hard to get the puck to the veteran guys. He turns down a few shots, but he's working on that and getting better. He's become a really reliable player for us." Even Capraro sounded a bit surprised when asked about his ability to find the back of the net. While he put up points consistently in college, Capraro didn't reach the 10-goal plateau until his senior season. "I'm more used to being a set-up guy, but it's just so happened that I've been more times in a shooting position than I have in a passing position," Capraro said. "I just try to take what they give me." One thing Capraro hasn't been given just yet is a chance to showcase his skills in the American Hockey League. While he did receive a tryout with the Hartford Wolf Pack, Capraro has yet to receive a promotion to Hartford or any other AHL squad. But that doesn't mean teams haven't taken notice. "I've had some teams not call directly about him, but they end up indirectly asking," Wilkinson said. "His name does come up. Nothing's come out of it just yet. It might be another season of him being a real point producer before somebody gives him a chance. The way the game's going and how hard he competes, he's a kid that you've got to see a little bit to appreciate. It's easy to pass him over, but I'm glad we didn't. His drive is incredible." Barring a promotion to the AHL, Capraro's focus will remain on the Checkers and their stretch drive to the Kelly Cup playoffs. Charlotte is in sixth place in the South Division at 26-24-6. "We're confident," Capraro said. "I think the team's got to be a little bit more consistent. When we play our best, we're a tough team to beat. When five guys play as a unit, we roll pretty well. We've got good players. We've got a good team. It's just a matter of who gets hot at the right time and who has the best chemistry going down the stretch."